It’s a blurry picture, but that’s cos I’m not a photographer. You probably noticed that already. Now I just have to get my act together and send it to them. Along with their xmas present. And the other parcels I still haven’t sent, even though they were ready to go weeks ago. 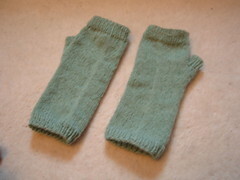 Last night, I finished knitting myself a pair of fingerless mitts. Our office is so cold at the moment, I’ve been taking my hot water bottle in with me, and not just for pain relief. These aught to help keep my poor hands warm while I’m working…and they’re made from one of the skeins of yarn I bought on our cruise in July, so happy memories too. And hey, look at that, I finally worked out how to insert pictures from Flikr…and change the size! 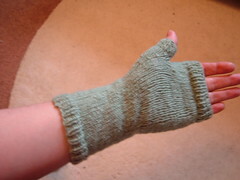 The gloves were loosely based on a pattern found on ravelry, but amended as I used a totally different yarn so it was really just the basic construction method I needed. I’m pleased with them. Again, bad photos, but have you any idea how hard it is to get a good photo of your own hand?! So, after Tuesday’s list of woes, the week evened itself up in the end. I finally got my car back from the garage. All fixed, but not cleaned. I finished the reports I’d promised for Friday, published on time. My stress levels came across in a phone call to the boss-man, so he insisted I finish early on Friday once the reports were published. I got hold of the prescriptions I needed from the Dr. Now I’m tired, hurting a bit, but okay. And (hooray!) a new week starts in just two days!! 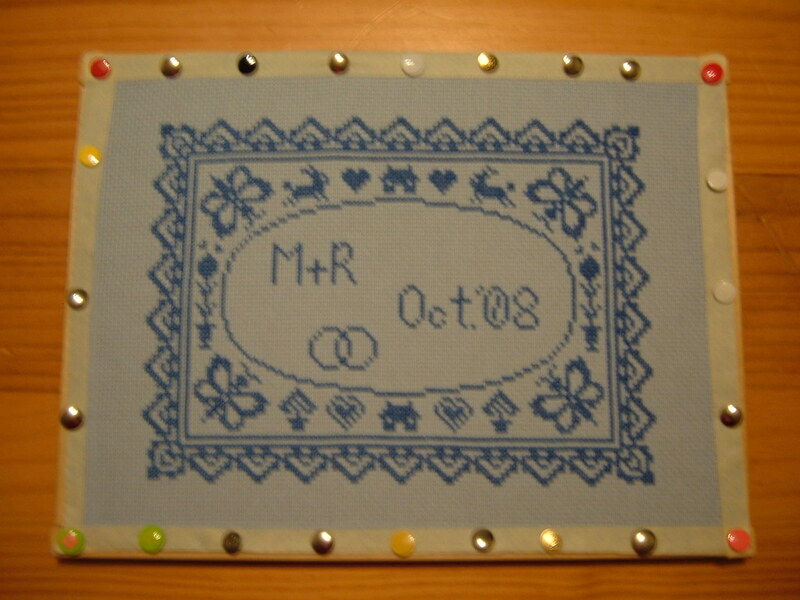 This entry was posted on November 29, 2008 at 11:51 am and is filed under Cross-Stitch, knitting. You can follow any responses to this entry through the RSS 2.0 feed. You can leave a response, or trackback from your own site.